Recently installed in the offices of a famous Hollywood film studio, the Airelight Linear SC blends perfectly into the ceiling grid and illuminates with minimalist flair. Designed to fit precisely between ceiling tiles on the T-Bar grid, the Airelight Linear SC easily incorporates with integrated magnets. Airelight Linears offer a strikingly thin 5mm profile and are capable of up to 770 lumens/foot. In addition, the linears are infinitely dimmable. 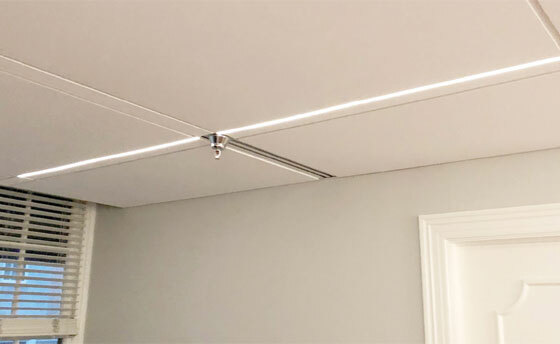 Available in two widths (0.5 and 1.0), the Airelight Linear SC is compatible with both the 9/16 inch as well as the 15/16 inch ceiling grid. Achieve any number of design configurations by installing individual linears or linking them together end to end. The ease of installation allows for the reconfiguration of lighting design without ceiling reconstruction.